Posted Friday, October 14th, 2011 by Robyn Warner. 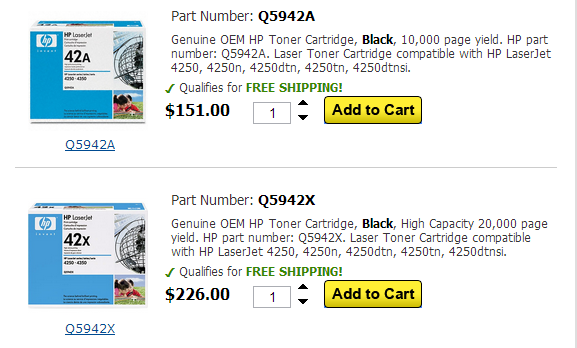 Though not available for all laser printers, many models offer a choice between standard and high-capacity cartridges. The primary differences are obvious- price and capacity. High-capacity cartridges are going to yield more prints, but you will have to spend more money upfront. Generally, these bigger cartridges are best suited for homes or offices with heavy print volumes. If you currently use the standard size cartridge and find yourself replacing it more frequently than you would like, the high-capacity version might be a better option. Let’s say your office has an HP LaserJet 4250 that is being used to print hundreds of documents a day. If you are using the standard cartridge, which yields 10,000 pages, you are probably purchasing replacements as often as once a month. This could be very time-consuming. If you opted to use the high-capacity cartridge, which can yield up to 20,000 prints, you would reduce the need for replacements by 50%, even though the price is a little higher upfront. You could purchase three at a time to ensure you always have backup toner and you would only need to order cartridges twice a year. When you look at the overall cost savings, it seems to make sense to purchase the high-capacity cartridges, but it’s not always the best solution. If you do not print high volumes, purchasing a cartridge that can produce 20,000 documents is completely unnecessary and could potentially be more trouble than it is worth. Cartridges do not last forever, so if you get a high-capacity cartridge that is only used occasionally or is inactive for extended periods of time, you run the risk of it failing. Whilst in the printer, the cartridge is exposed to heat, moisture and other elements that could render it unusable. High-capacity toner cartridges are a cost-effective option for high-volume printing, but might not be the best option for lower volume printing. Be aware of the needs of your home or office and purchase replacements accordingly. « What are Large Format Printers?